PT Garuda Indonesia (Persero) Tbk – Garuda Indonesia (IDX : GIAA) or referred to as “Garuda Indonesia Group” is a leading state-owned airline company in Indonesia. Garuda Indonesia Group operates primarily as a national flag carrier of Indonesia and is majority owned by the Government of Indonesia. As of December 2015, the Government of Indonesia is the majority shareholder at Garuda Indonesia Group, with 60.5% of ownership. Other shareholder Garuda Indonesia Group are Credit Suisse AG Singapore TR AC CL – PT Trans Airways (24.6%) and public (14.9%). Based in Soekarno–Hatta International Airport Cengkareng (near Jakarta), Garuda Indonesia Group now has 180 fleets (as at the end of August 2015). Its fleets include 137 Garuda’s main board fleets, and 43 Citilink’s fleets. In term of financial performance, Garuda Indonesia Group recorded a satisfiying financial result in 2015. 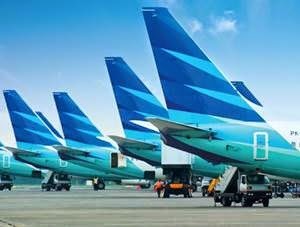 According to Garuda Indonesia Group Annual Report 2015 as cited by JobsCDC.com, Garuda Indonesia, the Company reported total profit for the current year (2015) of US$ 77.97 millions as compared with loss US$ 368.91 million in the previous year. Male/Female, Indonesian Citizen (WNI) with the maximum age of 27 years old. Minimum Bachelor Degree (S1) from all majors, preferably from Industrial Engineering, IT, Supply Chain, Management, Economics Accounting. Graduated from a reputable university with GPA min. 3.00 within 4.00 scales. Preference is given to applicants with at least 1 year working experience in the related field. Active in English language (oral and written). Operating knowledge of computer and information system applications, minimum Microsoft Office and Internet. Willing to be assigned in Soekarno-Hatta International Airport’s Office Area.